I never expected to be a writer. I grew up studying science and math and went on to a career in software development. I got kicked out of honors English after the ninth grade, and I got a D in English 102 in college. Writing was definitely not my thing. Then, about two years ago, I was reading amateur romance fiction on the internet. Most of it was not great, as is the case with any user-generated content site, but some of it was excellent. And while I was reading one particularly good story, I thought to myself, “Well, heck. I can do that.” So I did. I pulled together a bunch of ideas in my head, from the wonderful play Stop! Kiss! by Diana Son to a brief, abandoned storyline in a web comic I used to read, and a moment took shape. It was a first kiss in the middle of an evergreen forest between a straight(?) woman and her lesbian best friend. That moment was the core of the story, and the rest grew around it, both the before and the after. The characters got names and families and histories and friends, and then those characters got the same, and so on. The result was Evergreen Kiss. I published it on the site where I had been reading, and I got amazingly positive feedback. Internet comments may generally be a cesspool of hate, but the community there was nothing but supportive. I wrote another, and then another, and over two years, I amassed a collection of six full-length romance novellas, with a cast of characters that appear across the different stories. I also wrote four smaller pieces illustrating life outside the big romance, including one that ties all the characters together at the end. 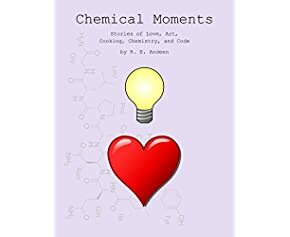 I’ve published all ten stories as a collection called Chemical Moments, and it’s now available on Amazon.com. Happy reading.